How do you decide film credits order? Do you always have to put the director first? Do you list in order of celebrity? Pull names from a hat? This is a common and complicated question because, frankly, there’s no real answer. There are industry “traditions” about credit roll order, but they’re fluid. There are occasional union and guild requirements on billing as well. Luckily, we're breaking down the standard film credits order hierarchies, some helpful tricks, and our “Feature and Short Film Credits Template”. Knowing how to do film credits is a lot like owning a file cabinet. You can have all the information, but unless you carefully organize it, you won't be able to pull names when you order your movie credits. 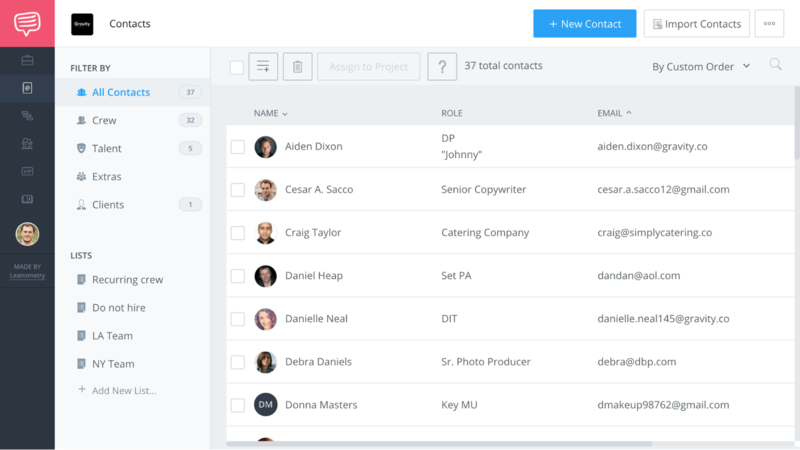 Whether you're using a film credits template or sticky notes, bucket your contacts into lists that you access at a glance. "Above The Line," "Talent," "Executive Producers," whichever labels you prefer, make sure your extensive list of names are organized. Make sure you spell your contacts right the first time. ​As you lay out movie credits, this mistake can take hours to fix. Unless you're using StudioBinder, which automatically applies contact changes across your call sheets, schedules, and reports. This is super helpful for a lot of different reasons, so don't limit yourself. Typical opening credits are fairly straightforward, especially if your film is signatory to guilds and unions that specify billing order. The credit roll order typically starts with the major companies involved. Then go to the “top billing,” those you are contractually obligated to credit before anyone else (usually the stars). After that, the opening credits proceed through a list of the most important contributors to the film, starting from the least important, ending with the most important. If you have an above-the-line individual on your team who performed multiple roles (such as a writer/director), don’t list the person twice. Merge the credits into one, and place by the credit roll order of the more “important” position. For example, a writer/director would be credited as such in the “Director” slot of the opening credits lineup (i.e. scrub to 2:48 in A Scanner Darkly video below). It can be a challenge to determine “importance” in opening film credits order. In some cases, a particular credit might be considered more important because of the type of film. For example, a choreographer might get an opening credit in a dance film with lots of musical numbers, or a supervising animator in an animated film. Let’s face it. Most people don’t bother to sit through the end credits past the first few names. But the purpose of film credits is not to entertain an audience. It’s to publicly acknowledge the people who contributed to your cinematic work. While there is technically not a “wrong way,” certain traditions have evolved around the closing credits order in which this gratitude is expressed. End credits start with above-the-line (ATL) individuals first, followed by certain key production personnel. As an example, check out the ending credits for Star Trek Into Darkness. Note: Though it is becoming more common to see some of these credits repeated in both the opening and closing of a film, it’s not necessary (unless by contract). The end credits crawl typically begins where the individual end credit title cards leave off. Often, the first credits that appear in the crawl are production department personnel, such as the Unit Production Manager. The entire cast is often listed next. Then, departments, such as Camera, G&E, Hair/Makeup, Wardrobe, Art Department, etc. Departmental lists begin with the department head, followed by the rest of the department, with departmental assistants listed last. When do I use logos in the credits? Sometimes companies or guilds require that you show their logo in the end credits where their equipment or members were used. Remember to check if these are required by your contracts, and note them in your film crew database. If they are not required it’s possible that you’re actually not allowed to include the logos in your end credits. How do you decide film credits order? Our free film credits worksheet template makes structuring film credits easy. Click to download our free feature and short film credits template / worksheet. And like all art, it doesn't hurt to copy from the best! If this credits guide hasn’t answered all your questions, I encourage you to try something that I do with most of my indie film credits ordering. Find a recent and similar film of the same genre, and look at its end credits as a guide. Art of the Title is a great resource to study great title sequence designs that spans television and films. Getting your film credits in order takes an eye for detail. Your job will be easier if you keep track of credits data early in production, especially when you are organizing your contact lists or generate your call sheets. What other practices do you follow when structuring your movie’s credits order? Share your thoughts with us below, and don’t forget to download our free feature/short film credits template / worksheet. VFX Supervisor rates a title card. Can you give advice for credits at end of a trailer, the order and who all to include? You have an example of end title credits in Star Trek Into Darkness, but your list for end title credits does not follow the example. Something needs to be revised. I think the Star Trek credits are the correct way to do it. thank you. Can you advise on what credit to use if I did everything except the acting, music and coloring.